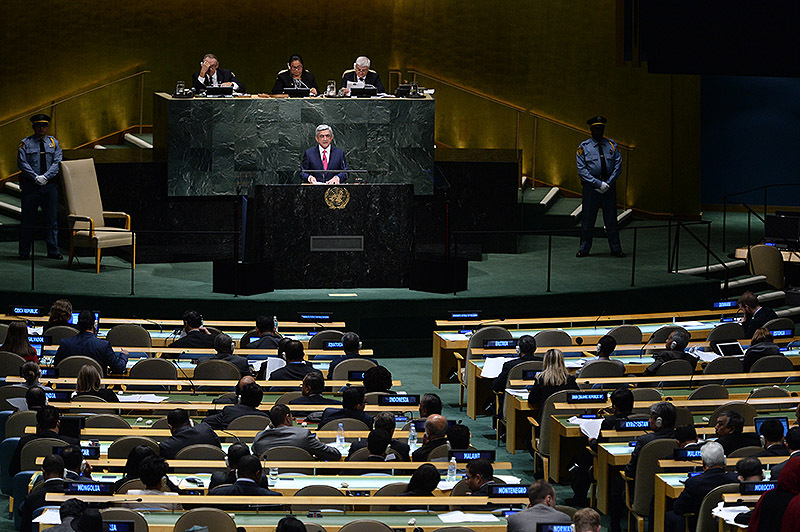 President Serzh Sargsyan who has made a working visit to the United States of America on September 24 took part in the 69th session of the United Nations (UN) General Assembly in New-York where he made a statement. 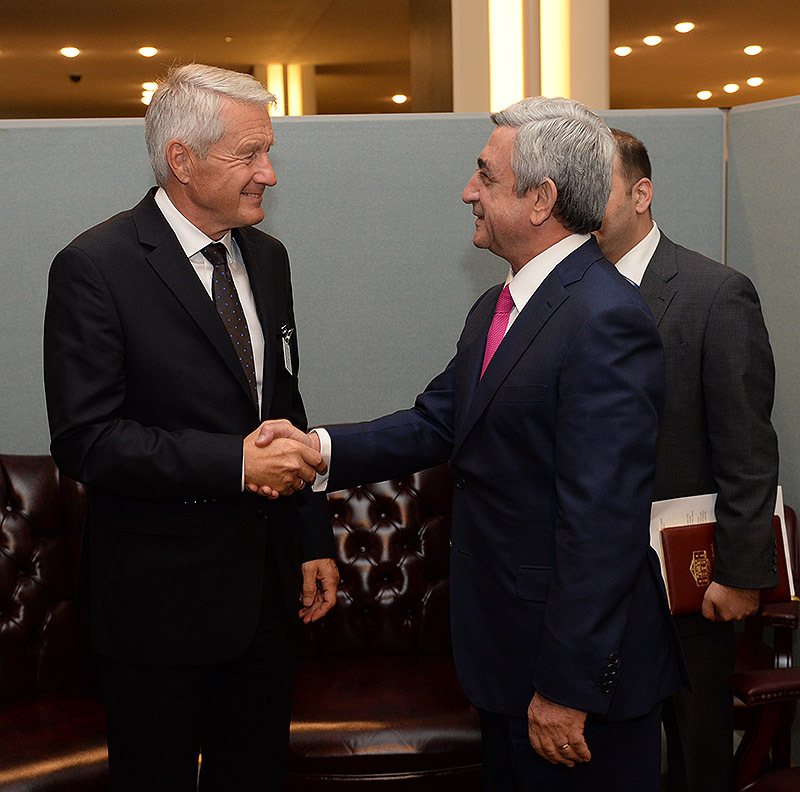 President Serzh Sargsyan on September 24 within the framework of the 69th session of the United Nations (UN) General Assembly held a meeting with the Secretary-General of the Council of Europe (CE) Thorbjorn Jagland. 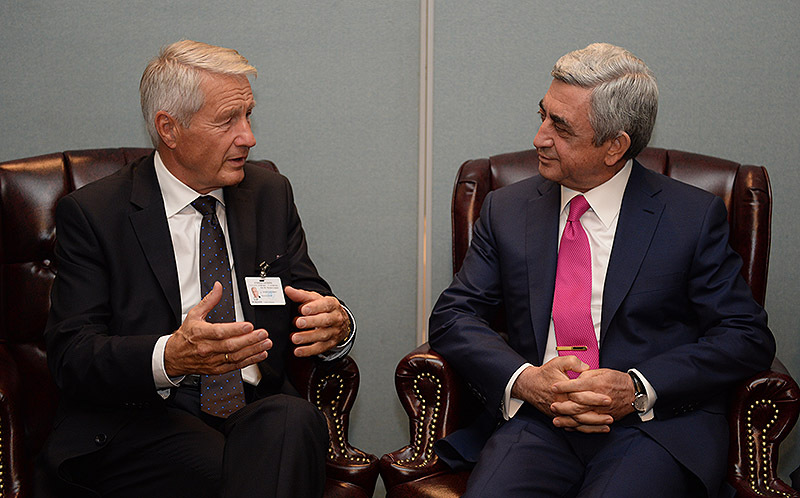 At the meeting President Serzh Sargsyan congratulated Thorbjorn Jagland once again on the occasion of being re-elected as CE Secretary-General and wished him further achievements in his responsible mission. 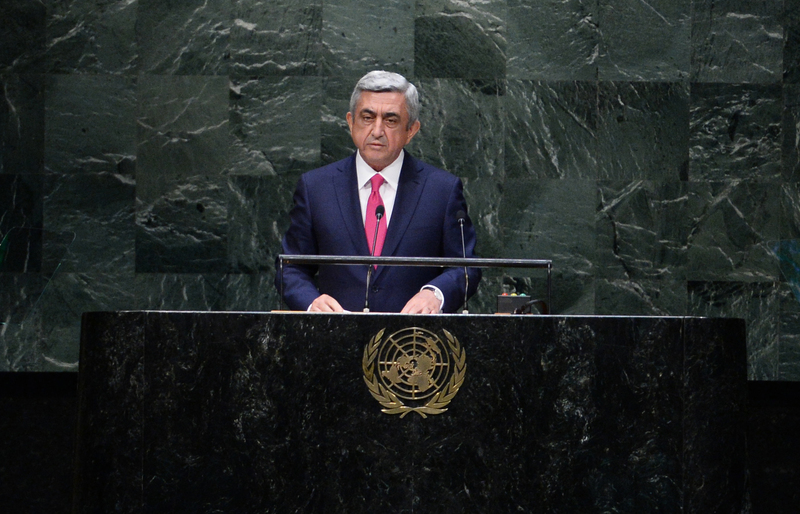 At the request of the CE Secretary-General the Armenian President presented the latest developments in the peace process of the Nagorno-Karabakh conflict. 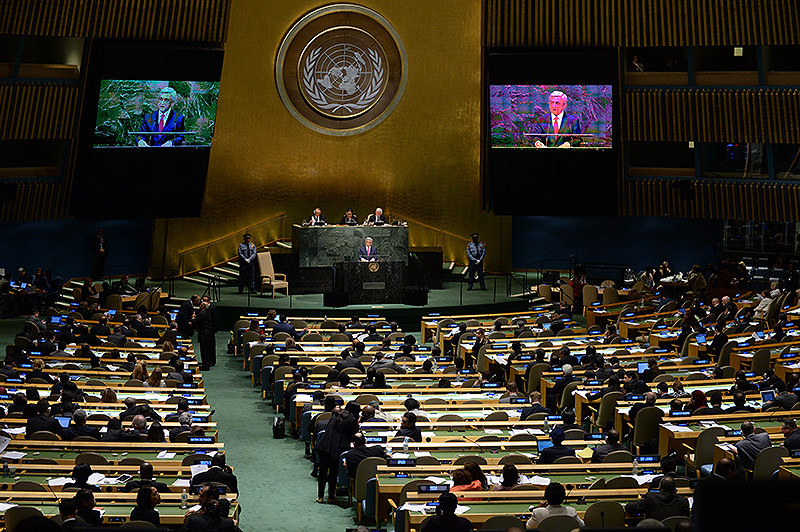 The parties emphasized the role of the OSCE Minsk Group in that process. At the meeting the process of RA constitutional amendments was also touched upon. 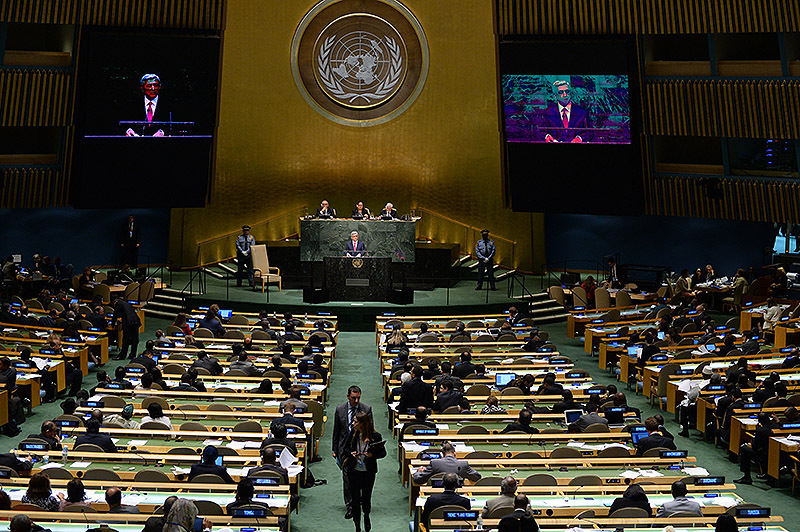 Thorbjorn Jagland attached great importance to the process and the participation of the Venice Commission in that. 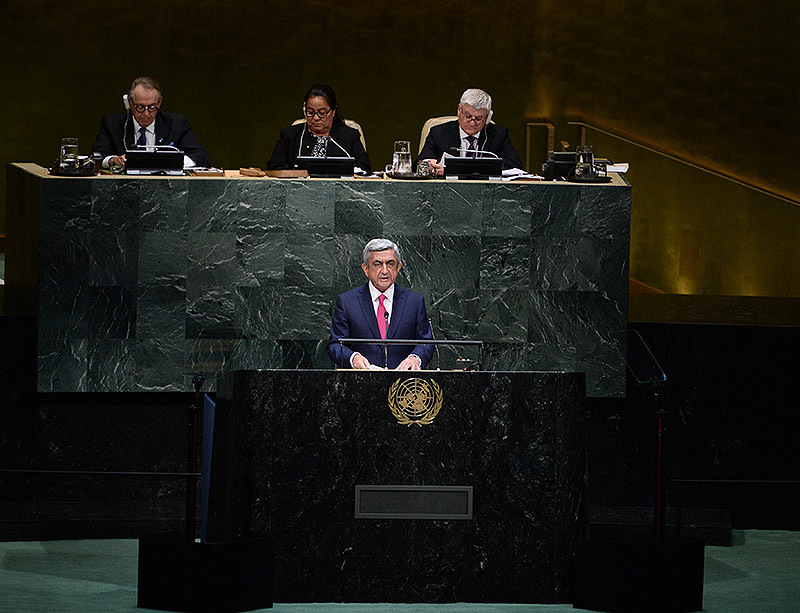 The CE Secretary-General reaffirmed the CE commitment to supporting that process and expressed his confidence that it will enhance the process aimed at developing Armenia and its society based on the principles of protection of human rights, democracy and the rule of law. 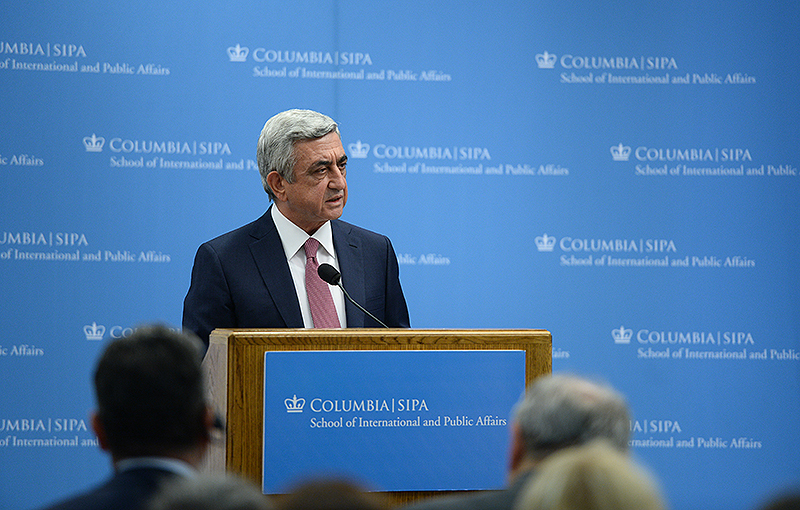 On September 24, within the framework of his working visit to the United States of America President Serzh Sargsyan was hosted in one of the most authoritative educational institutions of the world, Columbia University, where the president gave a lecture. 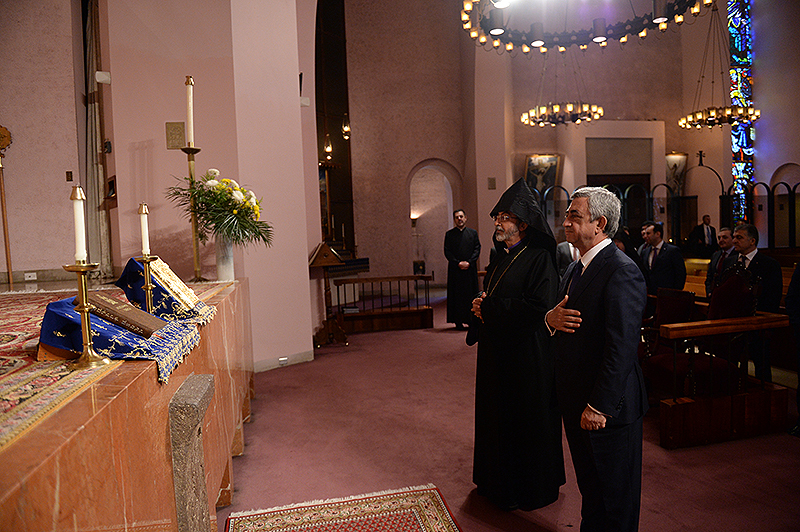 Serzh Sargsyan presented Armenia’s foreign policy issues, challenges and opportunities, touched upon the history of the Armenian people and their cultural and spiritual heritage, the chosen path of democratic development and the existing challenges. 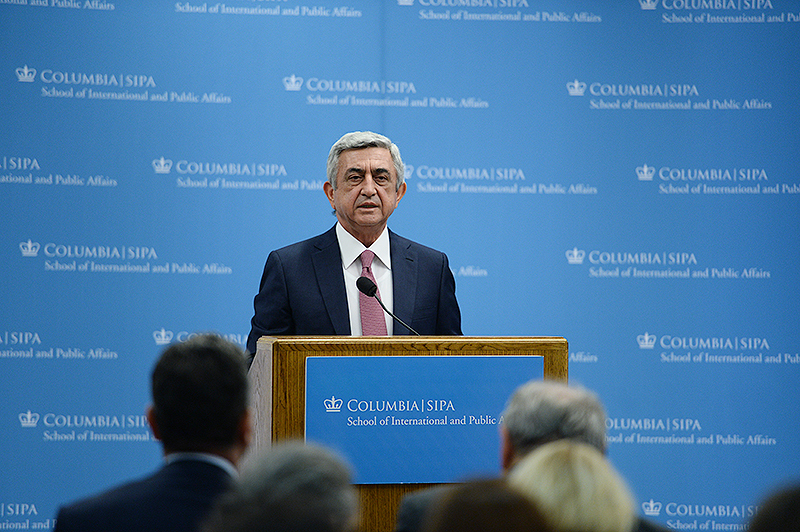 “Armenia has always made its foreign policy based on different arrangements, common interests of powers engaged in the region and not on drawing dividing lines between conflicts. I will give you a few examples. Armenia and Russia are strategic partners, and the Armenian-Russian Mutual Aid Agreement together with Armenia’s membership in the CSTO is one of the pillars of our security. 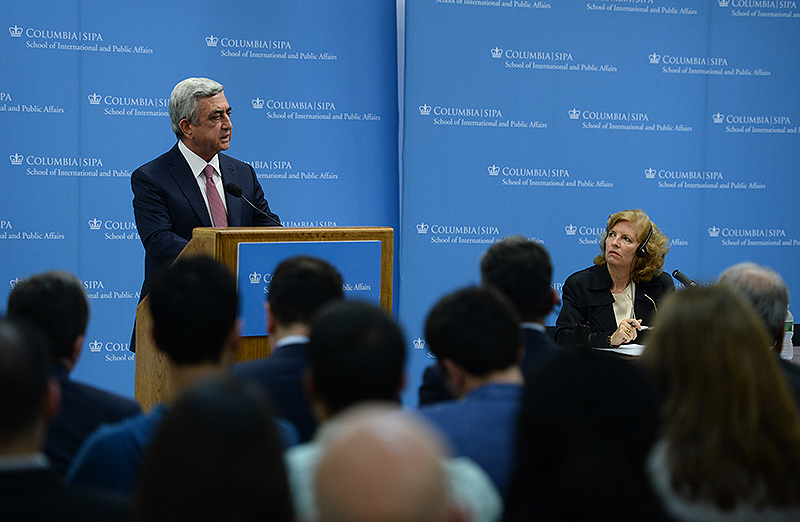 Simultaneously, in cooperation with the NATO Armenia is actively involved in ensuring international peace and stability both within the frameworks of individual action plans and international peace-keeping missions. 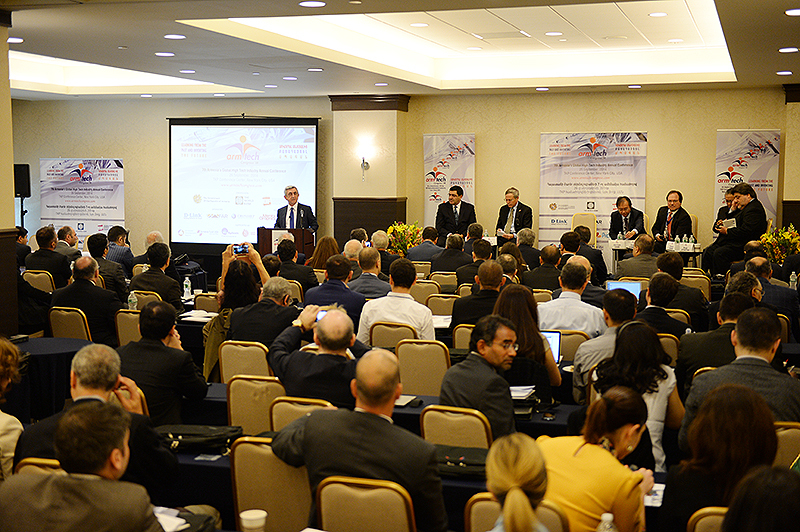 We attach great value to continuously promoting friendly partnership with the U.S. by embracing new spheres of cooperation. Today we are already conducting negotiations over facilitation of entrance visa regime. 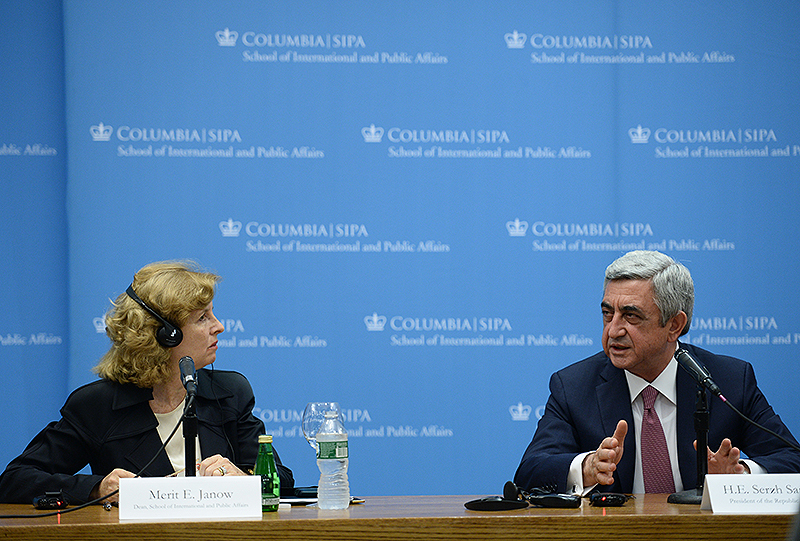 We highly appreciate the U.S. assistance to the Republic of Armenia. 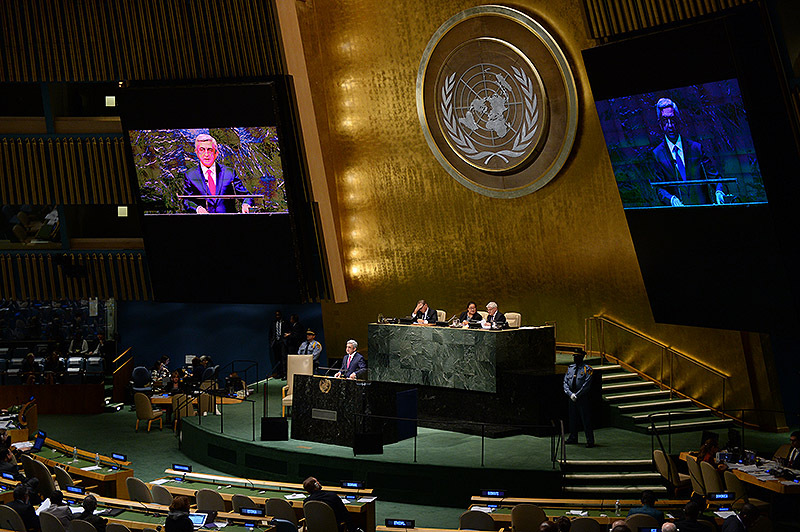 42 U.S. states have recognized the Armenian Genocide, and in recent years a number of states have recognized the independence of the Nagorno-Karabakh Republic and the right of the Artsakh people to live free. 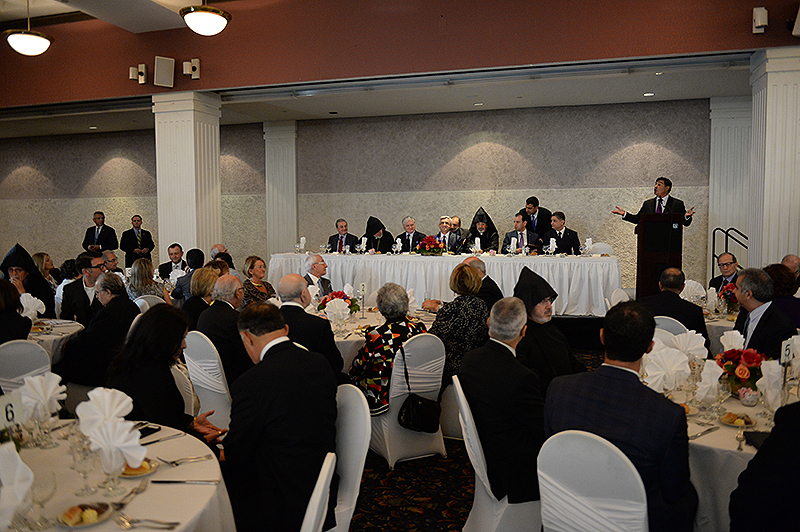 There is a huge Armenian community in the U.S. which certainly plays an active social and political role and is a special driving force in developing the Armenian-American relations. 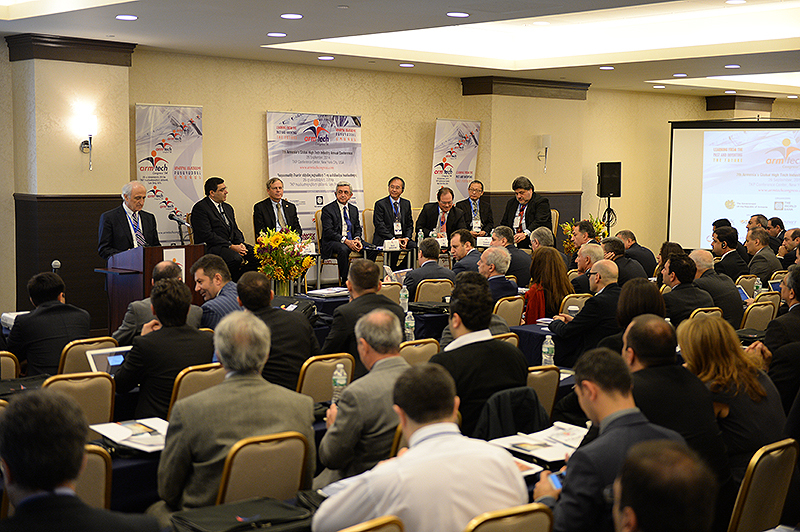 As you know, this year Armenia is going to join the Treaty on the establishment of the Eurasian Economic Union which will open up new horizons for further economic development and new opportunities for foreign investments. 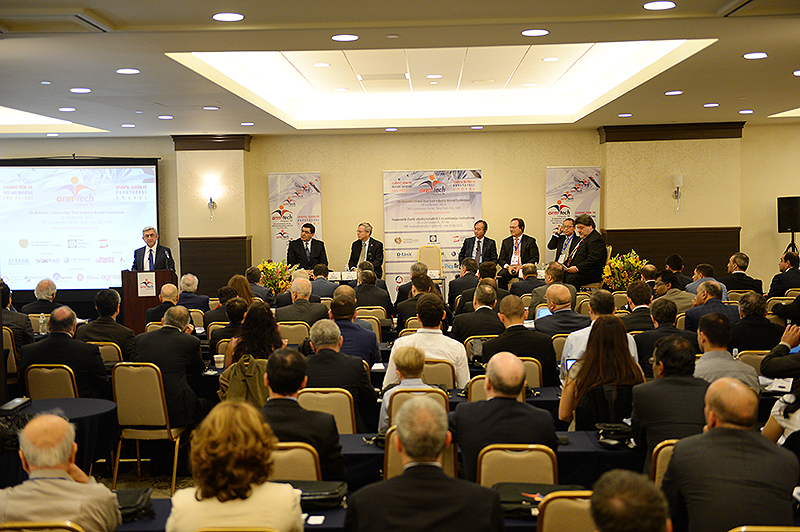 Concurrently, Armenia continues its comprehensive cooperation with the European Union both within the Eastern Partnership and bilateral formats. With the help of the European Union and the West our country has implemented key reforms in the spheres of democracy, human rights, the rule of law, free market economy and in many other important spheres. I am sure those reforms will last long. 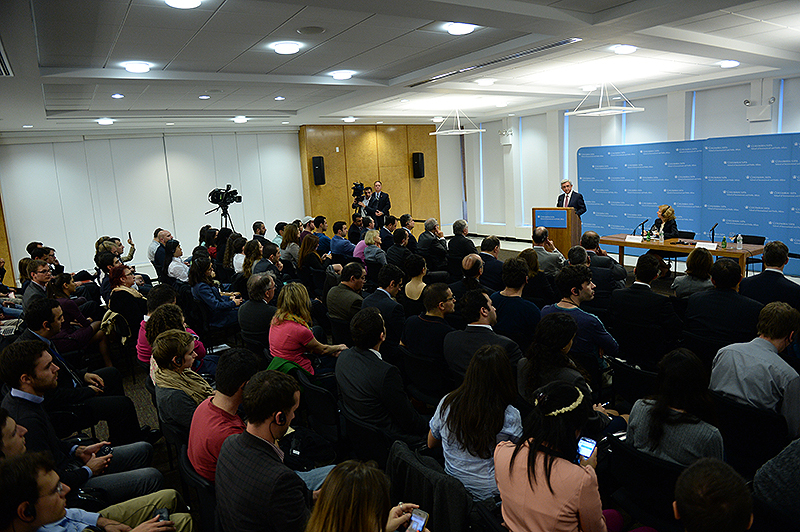 We are fully aware that they do not seek to integrate Armenia into this or that organization; we are the first who need them. Moreover, nowadays when interstate borders are becoming more and more transparent, and various inter-continental economic zones are being formed, there is no sense in talking about contradiction of different arrangements. There is also no sense in grounding your own foreign policy on those contradictions. 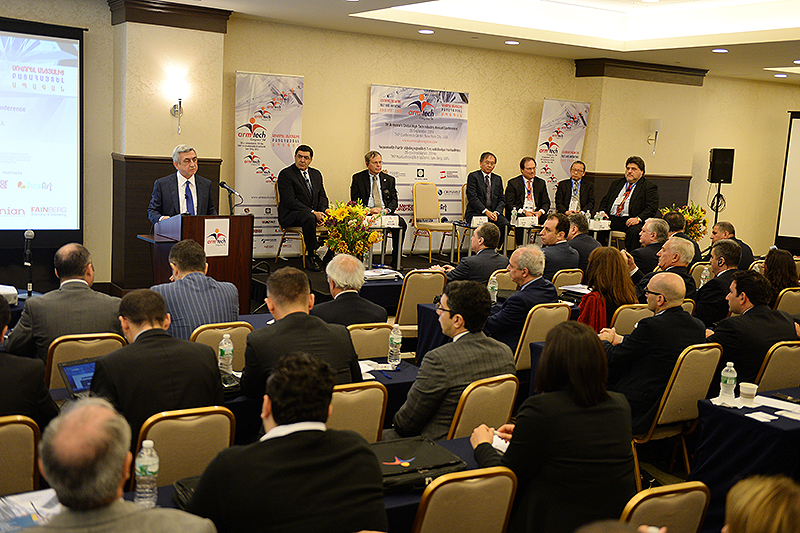 We are sure that by joining the Eurasian Economic Union, Armenia will link the business communities operating in this area to those of western countries. Therefore, we try to develop such mechanisms for cooperation with our partners which conform and not contradict to each other. These are not just words, this is our mentality, our everyday work, our vision, and we have come to that conclusion based on our own experience. 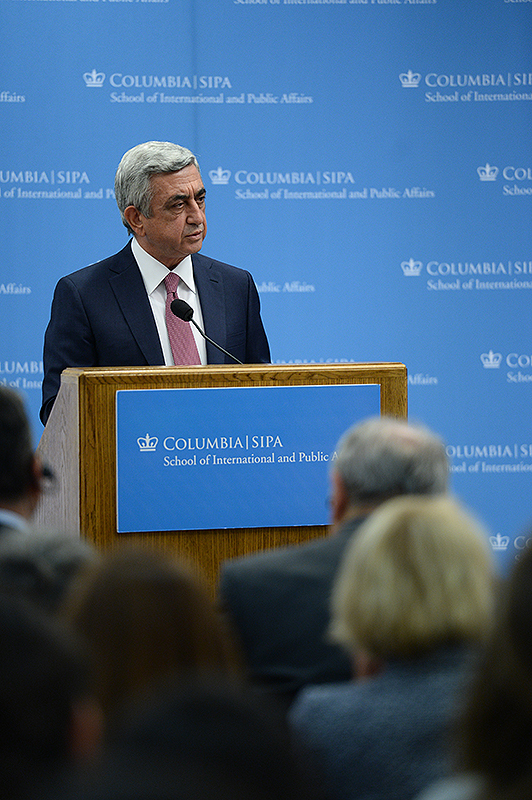 We are persistently pushing forward our bilateral European agenda as well. 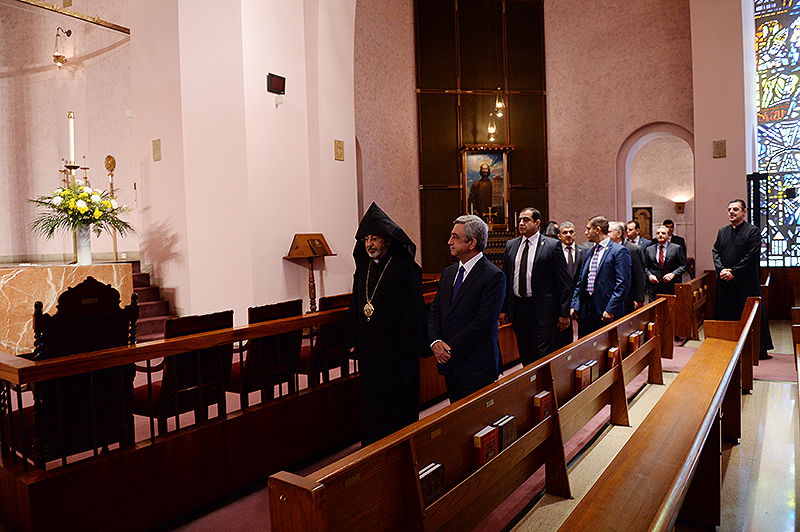 In recent 4-5 months I have visited a series of European countries and have also hosted numerous heads of countries and other dignitaries in Armenia,” said the Armenian President. 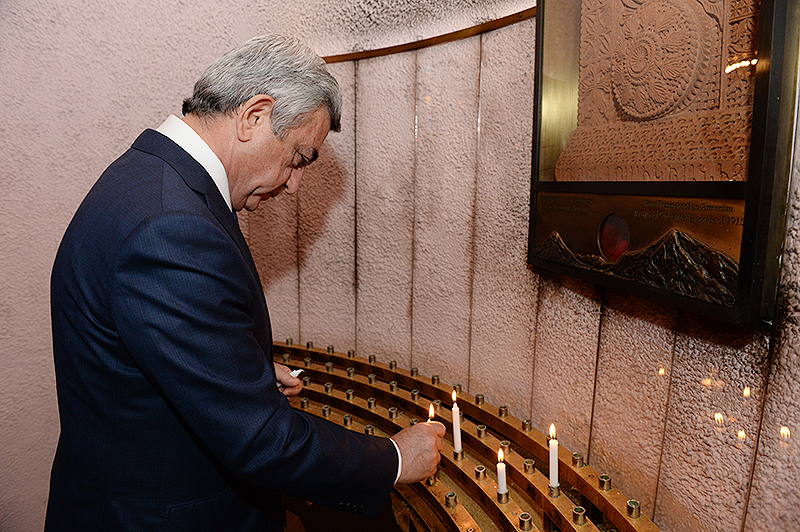 Serzh Sargsyan considered well-educated and devoted youth as the guarantor of Armenia’s development, talked about Armenian educational traditions dating back to the Middle Ages when such eminent Armenian educational centers as the Universities of Gladzor and Tatev played a central role in developing religious, social, political, philosophic and also creative though of the time. 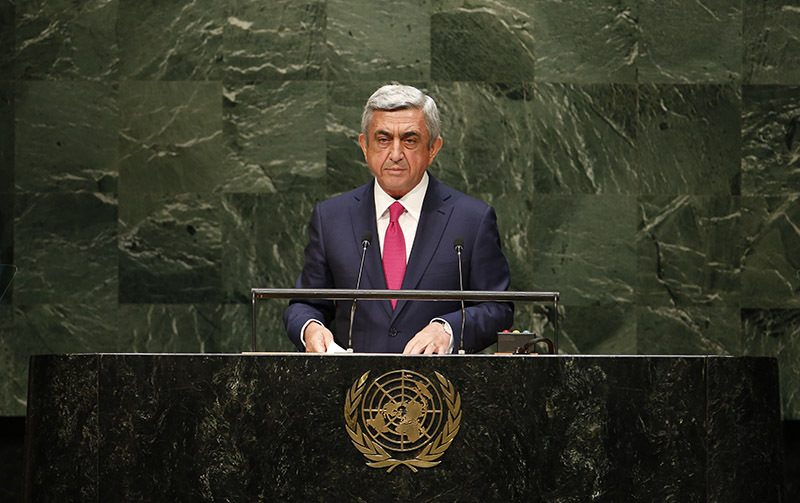 The Armenian President presented the vital steps directed at improving the education system in Armenia and in that context touched upon the activities of Luys Foundation: “The establishment of Luys Foundation which sponsors Armenian youth to study at world’s leading higher educational institutions, including your university and to use their knowledge in strengthening the homeland is our next important initiative. 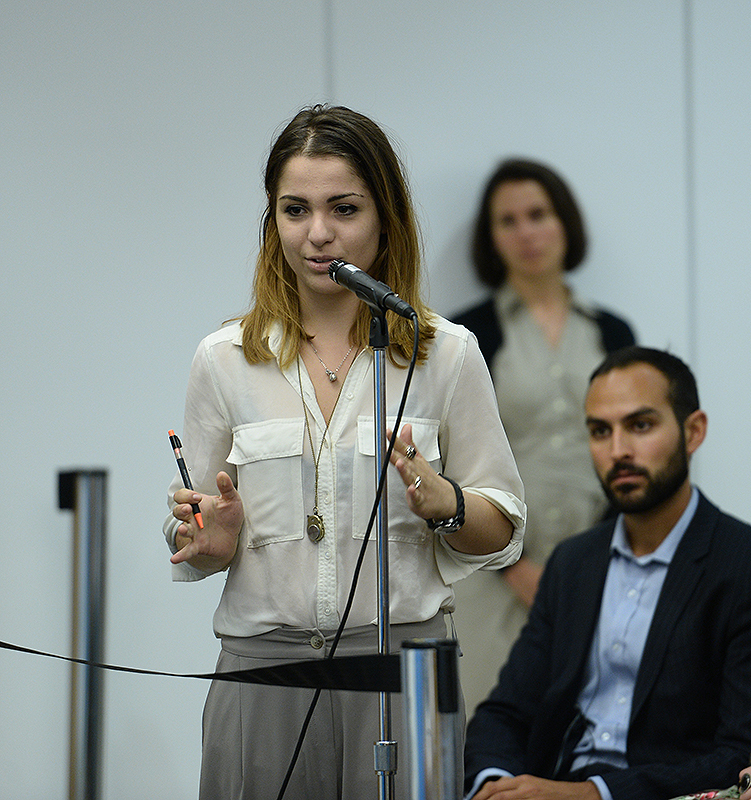 The American-Armenian Aso Tavitian who gives numerous Armenians, including diplomats the opportunity to receive best competitive education in the U.S. is one of the famous sponsors of that initiative. 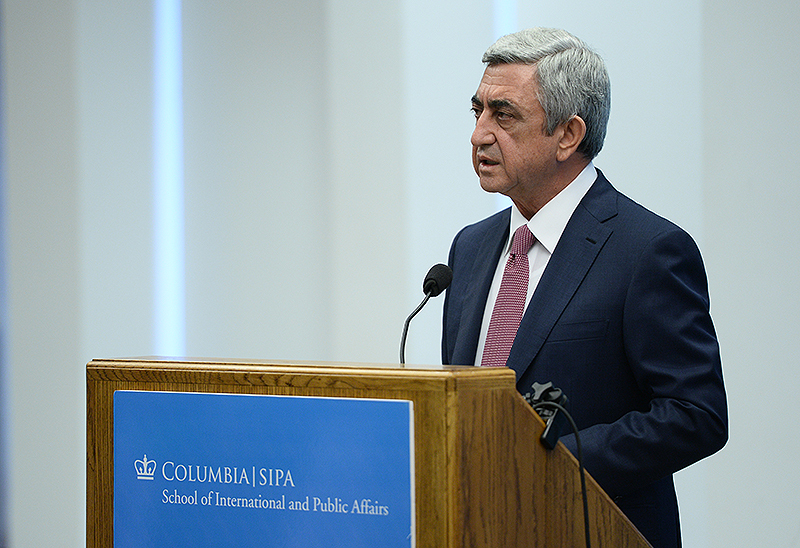 I personally think that education dignifies people, and having a dignified young generation is a huge wealth for a small country such as Armenia,” underscored Serzh Sargsyan. 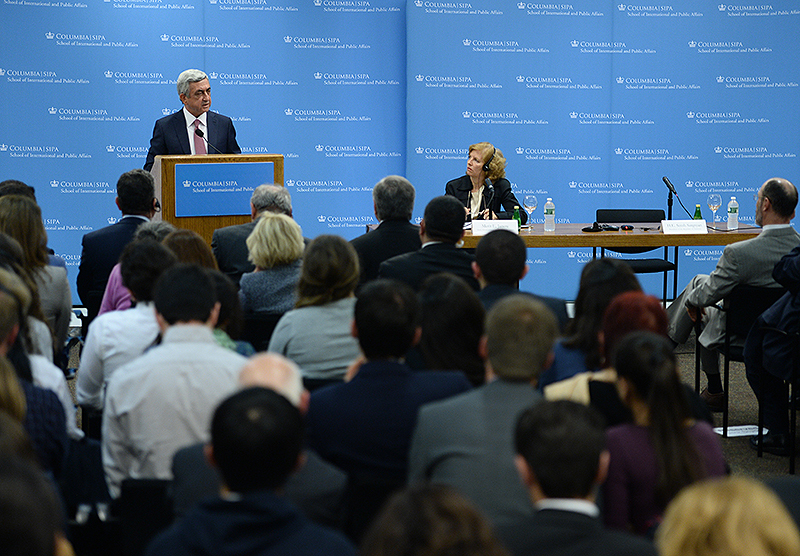 The president also noted that the Armenian government, in cooperation with the University of Cambridge and London Institute of Education, has recently launched a large-scale educational initiative which is called “National Program for Teaching Excellence.” The aim of the program is to put a larger value on the role of the teacher in our society, to make the specialization of the servant of education attractive, to direct the best human resources towards education and create a competitive community of teachers who recognize their mission. 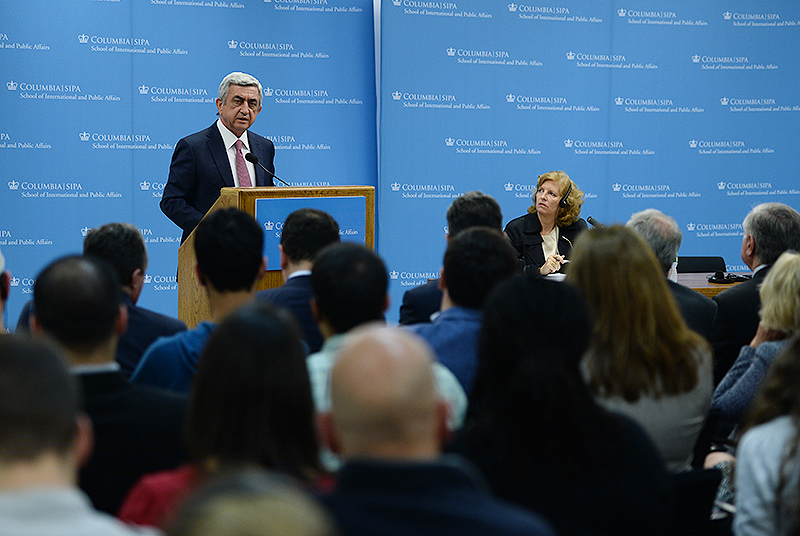 Serzh Sargsyan spoke about the current geopolitical situation, challenges threatening global stability and especially about the dangerous developments of the recent period, presented Armenia’s position and our country’s growing involvement in peace-keeping missions, as a donor, Armenia’s assistance to minorities displaced as a result of extremists’ barbarities, the steps aimed at providing refugees with apartments and noted that Armenia has received more than ten thousand refugees just from Syria. 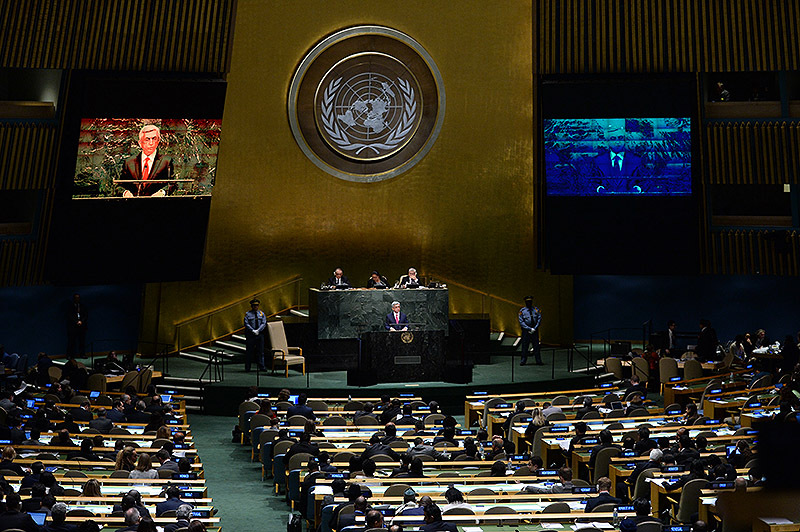 “Dear participants, having occupied high state positions for 25 years now and being fully aware of the level of responsibility which every official, especially a head of a state bears, I have come to the conclusion that altogether we have a unique opportunity to pass on safer and more prosperous world to coming generations, and the only right way to do it is to transform existing challenges into opportunities,” underlined President Serzh Sargsyan. 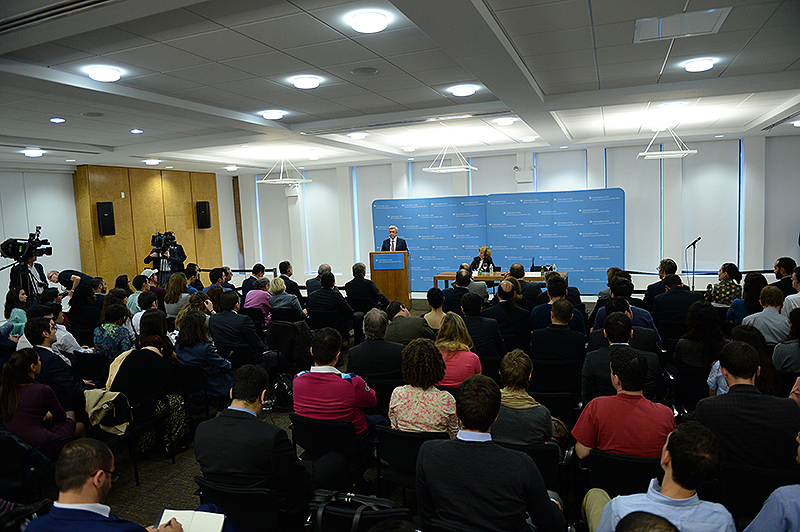 The RA President also answered the questions of the participants pertaining to multifarious topics – Armenia’s foreign policy, including the development of the Armenian-American bilateral relations, the Armenia-European Union cooperation and its prospect, Armenia’s development opportunities after joining the Eurasian Economic Union, the Armenia-Russia relations, as well as to Armenia’s internal policy, its social and economic problems and priorities for economic development, regional challenges, the recent developments in the peace process of the Nagorno-Karabakh conflict and its prospect. 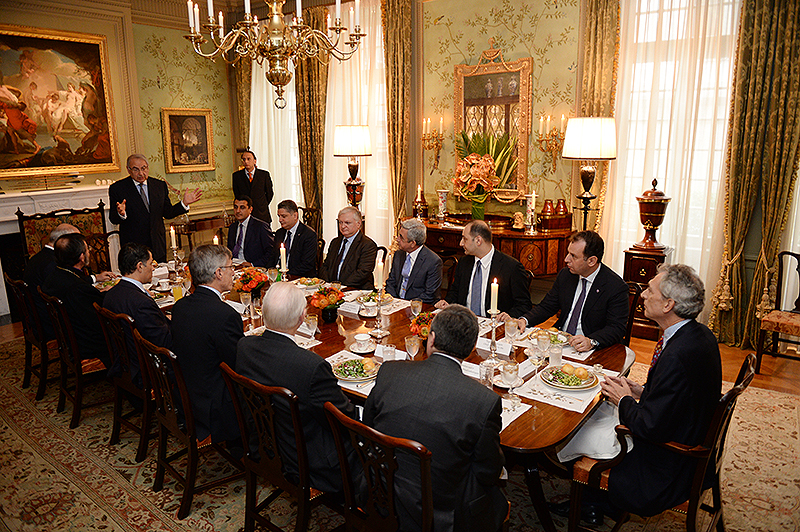 On his working visit to the United States, President Serzh Sargsyan on September 25 held a meeting with the leading U.S. international relations experts James (Jim) Collins, James (Jim) Traub, Stephen Sestanovich and Vali Nasr. 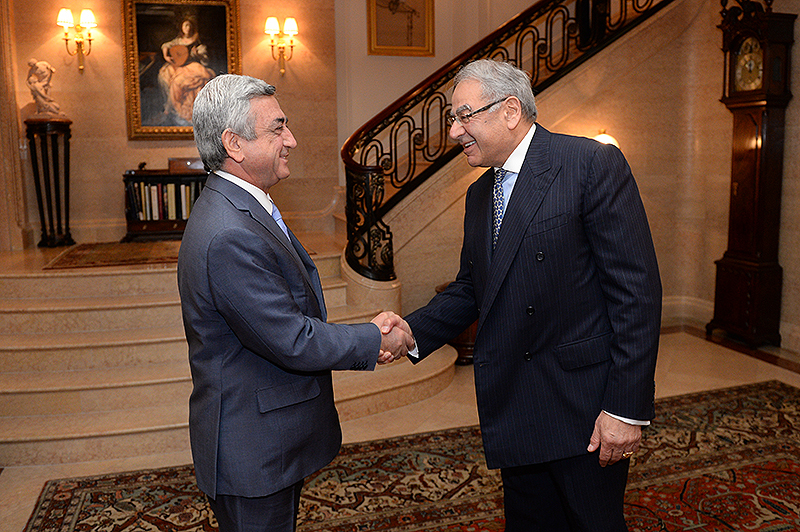 The RA President and international experts were hosted by the American-Armenian benefactor Aso Tavitian. 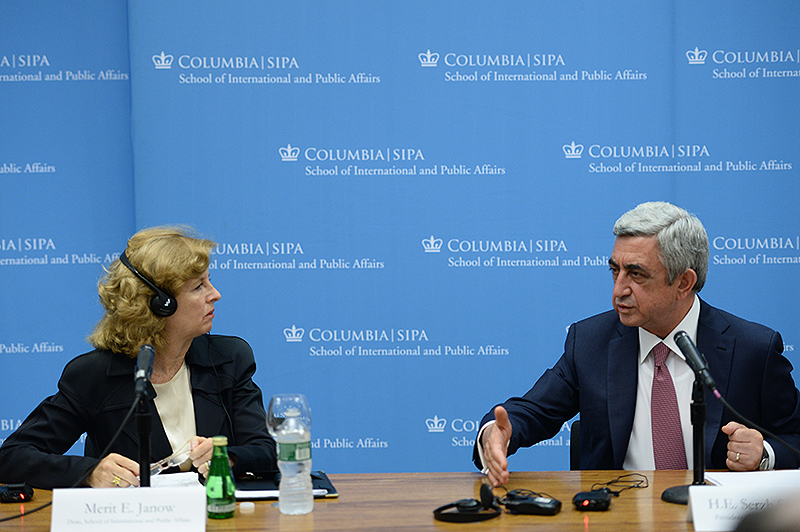 The experts presented President Serzh Sargsyan their assessments on the current state and the latest developments in the South Caucasus and the Middle East. There took place an exchange of views. 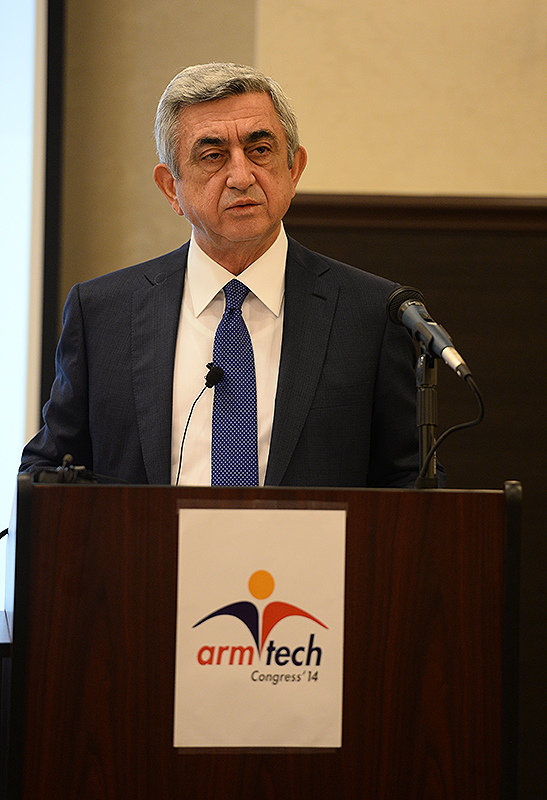 President Serzh Sargsyan on September 26 took part in ArmTech Congress 2014 where he delivered a welcome speech. 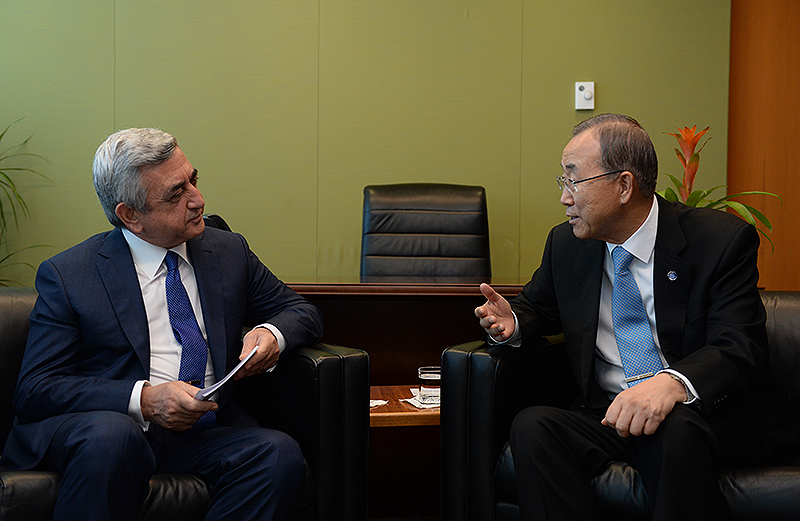 President Serzh Sargsyan on September 26 held a meeting with the Secretary-General of the United Nations (UN) Ban Ki-moon. 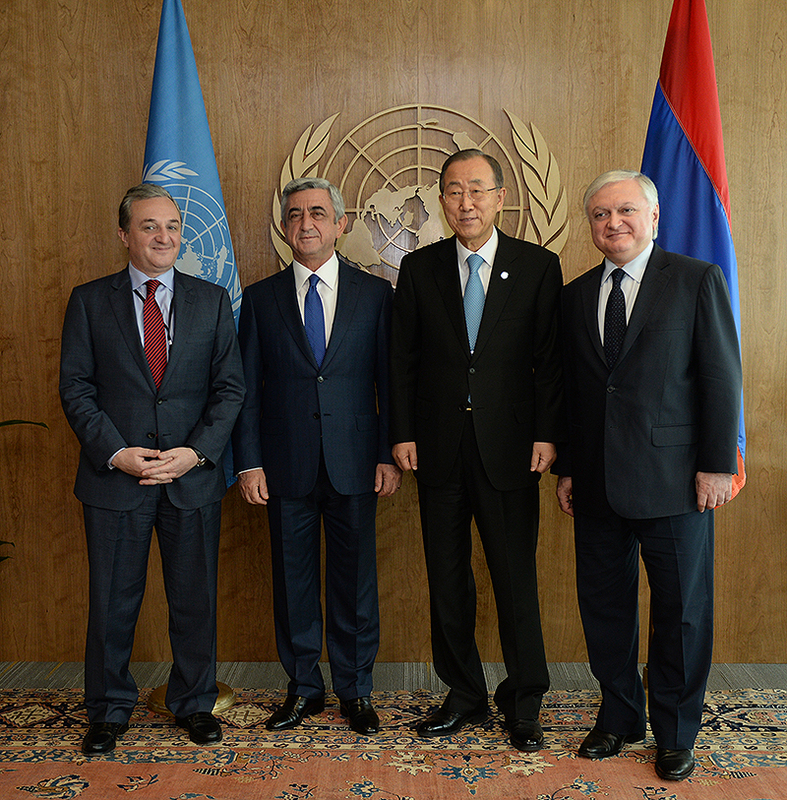 Serzh Sargsyan and the UN Secretary-General exchanged views on the vital issues discussed at the 69th session of the UN General Assembly in New-York. 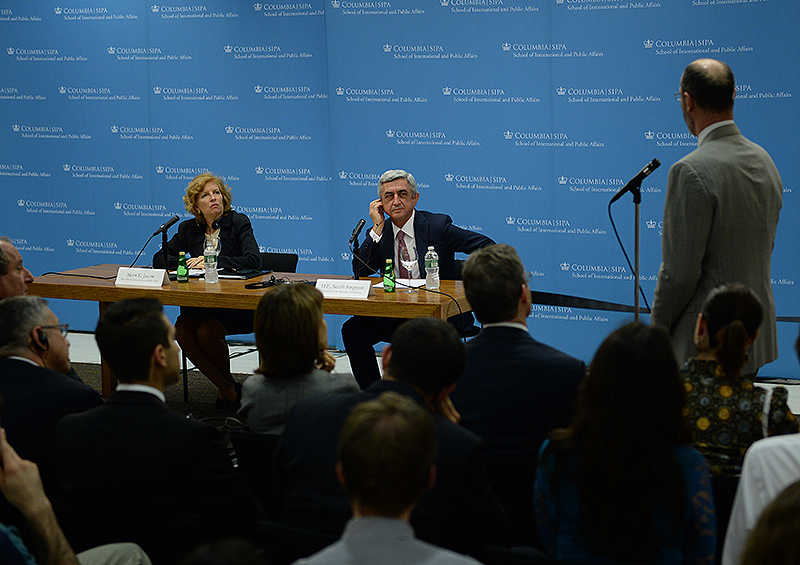 The interlocutors discussed issues with regard to stability and security in the South Caucasus. 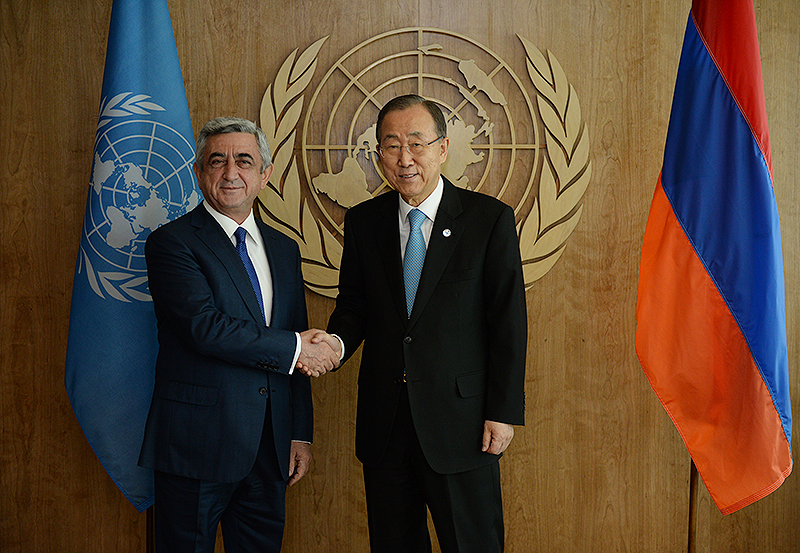 The Armenian President presented the UN Secretary-General the latest developments in the peace process of the Nagorno-Karabakh conflict. 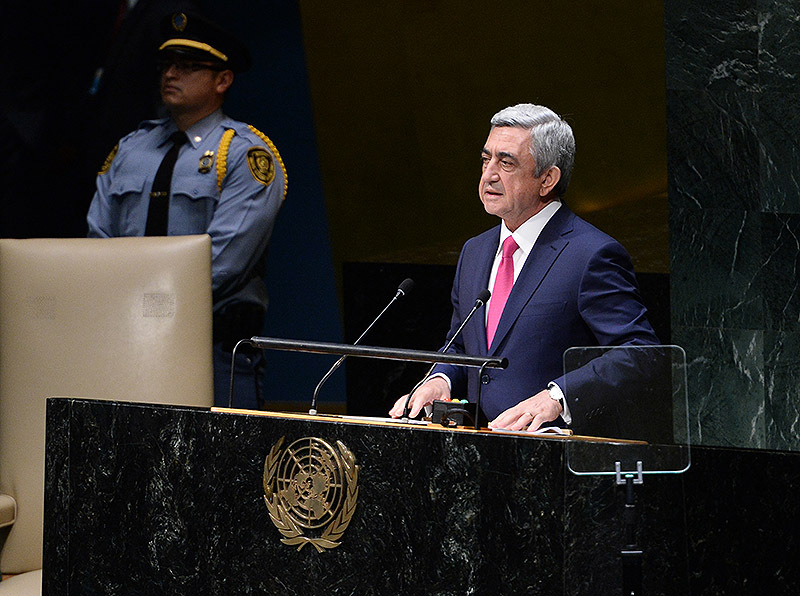 Serzh Sargsyan reaffirmed Armenia’s commitment to being actively engaged in activities carried out by the UN and its organizations. 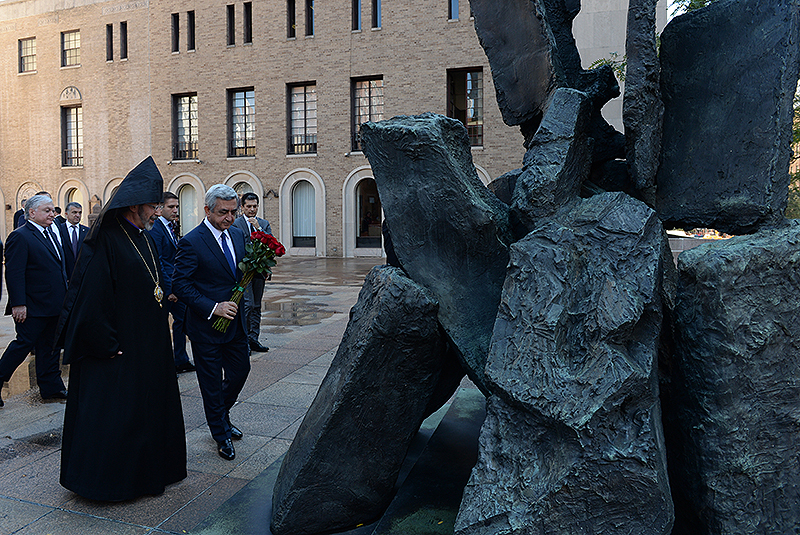 President Serzh Sargsyan also visited St. Vartan Armenian Cathedral in New-York and placed flowers at the memorial to the victims of the Armenian Genocide. 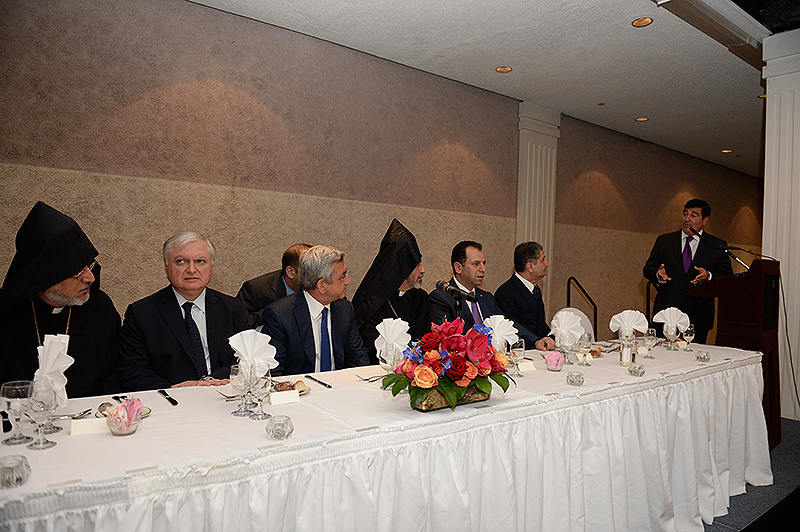 Later on, the Armenian President held a meeting with the eminent representatives of the Armenian communities in New-York and New Jersey during a working dinner held by the leader of the Eastern Diocese of the Armenian Apostolic Church in the U.S. Archbishop Khazhak Parsamyan.